There are literally hundreds of reviews about Fujifilms X-Pro1 at your fingertips, so I hope this report provides some useful information if you are thinking about purchasing the camera or another in the X-series. I want to discuss my real world experiences that relate specifically to using this gem of a camera for a subject that is somewhat of a passion for me - Urban Exploration. 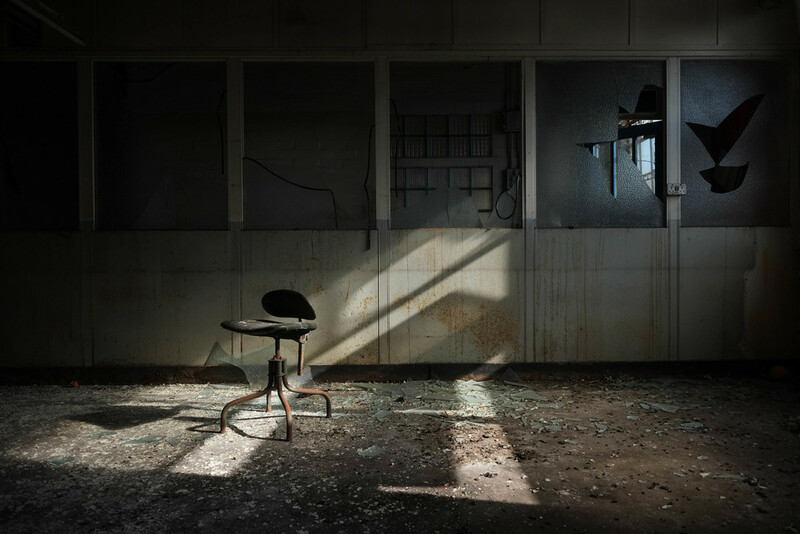 Urban Exploration (or Urbexing) is the relatively popular sport of hunting out abandoned or derelict buildings and documenting the adventure with a camera. There are UK forums (28 Days Later being the most ubiquitous) dedicated to the subject, which can often give other Urbexers a lead for their next mission. Urbexing does involve trespassing (which in itself is not a criminal offence in the UK) but there is an Urbex maxim: ‘Leave no trace, other than footprints’. That means no taking any ‘souvenirs’ from your exploits and definitely no breaking and entering. Ever. You either walk, climb, crawl or jump straight into the building or you don’t do it. Sometimes this means going home ‘empty handed’ but thats the nature of the beast. The Adventure - Treading a path through a disused operating theatre in a hospital or an old make-up factory where you can still smell the perfumes is a heady experience indeed. To make acquaintance with these premises is to step into history, with many of the places we explore feeling like a macabre theme park. Speaking of History - Who worked there over the years? You can often find clues in a staff kitchen or etched on the back of a staff toilet door. You may not get a clear answer, but it’s possible to piece together fragments of workers lives from these traces. Additionally documenting the last breaths of the structure, often shortly before demolition, is something that I consider to be an important process... Myself and my fellow Urbexers are self-appointed photojournalists of the forgotten. But I often need to shoot at ISO 6400, 1/30 sec at the widest possible aperture. More on this later. So how does the X-Pro1 fit into all of this? Portability - The explosion of mirrorless cameras has to have had a detrimental impact on an Osteopaths workload. For many, gone are the days of having to hulk several kilos of DSLR equipment around over their shoulder. As we sometimes have to clamber through a pretty small space or balance precariously on a ledge to reach our goal, a compact system is not only necessary but perhaps essential to safely access the prize. Of my two cronies who Urbex with me, one packs a Leica M9P and the other an iPhone 5. So we all value portability highly, but the Leica shooter always carries his Manfrotto tripod with him. Price-wise I fit bang in the middle with my X-Pro1, usually carrying just the 35mm f1.4 and 14mm f2.8. The X-Pro1 delivers in this regard with a great size: image quality: cost ratio. Fuji Glass - Due to the low available light in a derelict building (I’m yet to come across one still hooked up to the mains), fast glass which delivers on quality wide open is a no longer a luxury but an absolute necessity. Thankfully both the 35 and 14mm lenses produce fantastic images wide open. ISO - The oft near-darkness demands almost magical qualities from a sensor. Happily, the X-Pro1 again delivers the goods... in spades. Whereas my fellow Urbexer with his M9P struggles with ISOs above 800, I regularly shoot at 6400 with few issues. For this reason his Leica is permanently fixed to the tripod. Whilst he is lining up his first shot for 15 mins I’ve already got my eye in having fired 10 shots with my hand-held Fuji. For me this is an important advantage over the MFT range, as the smaller sensor doesn’t quite hold up at lofty ISOs quite like the Fuji system. IQ - The X-Trans sensor with no AA-filter has a resolution on par with the last generation of full-frame DSLRs. Quite a feat for an APS-C sensor. The dynamic range is also very impressive on the X-series, and can be artificially boosted further if 200% or 400% DR settings are selected. For my images I keep the DR at 100% as I want the dark areas to be very dark for the atmosphere it brings. The great Fuji glass combined with the fabulous ISO performance means that a crisp image is possible in almost all light conditions. This makes me a very happy Urbexer. A very happy Urbexer indeed. Shutter Speeds - The low light in a derelict building sometimes forces me to use a slower shutter speed than I would like. I’ve shot hand-held at 1/30 and even 1/15 seconds and got a critically sharp image. The mirrorless design of the X-Pro1, without the mirror-slap found in DSLRs probably aids this. One negative is that there is no Image Stabilisation in the camera body or prime lenses. As IS is supposed to degrade IQ somewhat, I personally would rather it wasn’t there anyway. I feel that the ISO performance, fast apertures and the possibility of shooting with slow shutter speeds largely negates the need for IS in the X-Pro1. AF - Perhaps the most heated debates about the X-Pro1 relate to the cameras contrast detect AF system. It is no where near as quick as a phase detect DSLR, or for that matter Olympus’ OMD. If you demand instant AF then the X-series is probably not for you. Having said that, each firmware update has improved the X-Pro1 (I’ve owned it since release) and it is now very good - and despite what you may have read it was never that bad!! For my Urbexing images, there are rarely people in the shot but either way I take a meditative approach to composing a shot. The AF therefore never gets in the way for me. So one of the most complained about ‘issues’ of the X-series doesn’t impact on my photography. Happy days. EVF vs OVF - The X-Pro1 is often regarded as a street shooting machine. Indeed I do turn my hand to a bit of street from time to time (please see my Six Degrees series). For this discipline the OVF becomes very handy. For Urbexing you might think that the OVF is more suited to the lower light environments, but my photographic style involves meticulous framing that demands the 100% sensor view of the EVF. Even in very low light the EVF image doesn’t become too grainy to use accurately. In Summary - As you may be able to deduce, I love my X-Pro1. For Urbexing and beyond it is the perfect camera for me. I genuinely cannot think of how I would change it (other than zero noise at ISO 102400 and AF speeds of 0.0001s). The single most important component of a camera is the twelve inches behind it (Ansel Adams) - although it may be less than a foot with a mirrorless camera, Ansel! Whilst I believe both these statements to be true, the Fujifilm X-Pro1 ensures both are easier to achieve.